Columbia Games touts itself as 'the home of block wargaming'. With the amount of games and how long they have been producing them, who am I to argue? I have reviewed two of their games so far: 'Julius Caesar' and 'Combat Infantry'. Julius Caesar is a good game, and it has a large following. However, I think Combat Infantry is a great game and a blast to play. 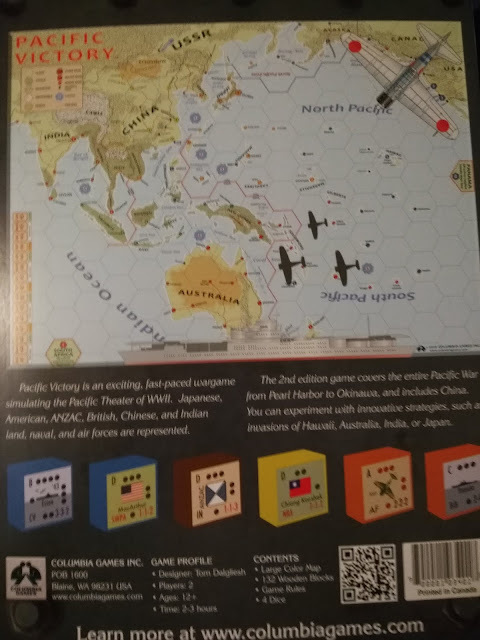 So, they were kind enough to send me the second edition of 'Pacific Victory'. I never played the first edition, so I cannot compare the two. I will look online and see other people's comparison and see if there are any good or bad things that there are a consensus about. The game also comes with two rule books, which is an excellent idea. Now two gamers can read their own copy, so you do not have to waste your time copying the rule book. More games should do this. 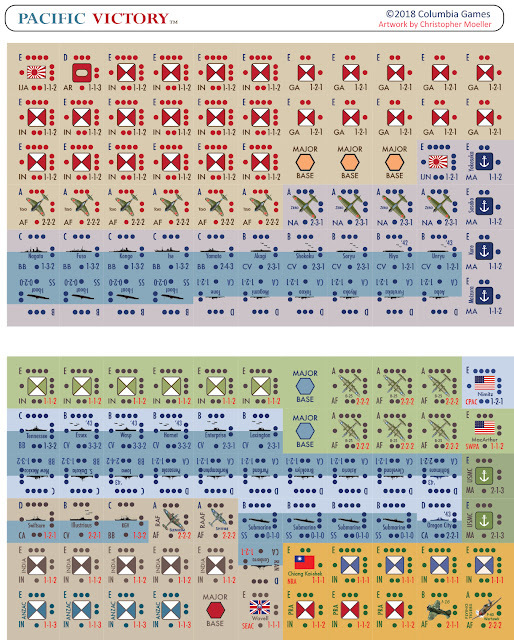 Japanese individual Infantry or Marine units can declare a Banzai attack. This increases the unit's firepower for one fire against a target unit. But the unit is eliminated unless it eliminates the target unit. Japanese Infantry or Marines have D2 defending any minor base, but cannot retreat. 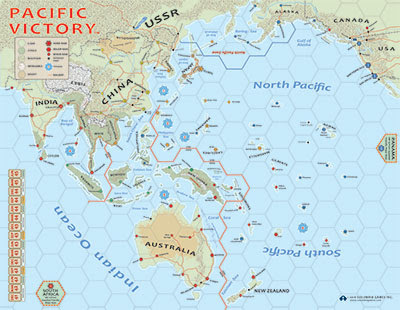 The game also covers the entire Pacific War. The game does come with rules so that the Chinese part of the war is removed. This makes for a quicker game. The map is large, and is relatively simple looking. However, this approach works well for the game. It is easy to read and figure out the different terrain. The large amount of blocks to sticker might be a problem for some people. I lucked out and lassoed my daughter into helping me. The stickers are very good looking. They are also simple without any great embellishment. The blocks are the standard size, so they are easy to read and see at a glance what units you have where. Each unit is marked with an A,B,CD, or E. These represent where during a combat round a unit attacks. A goes first etc. 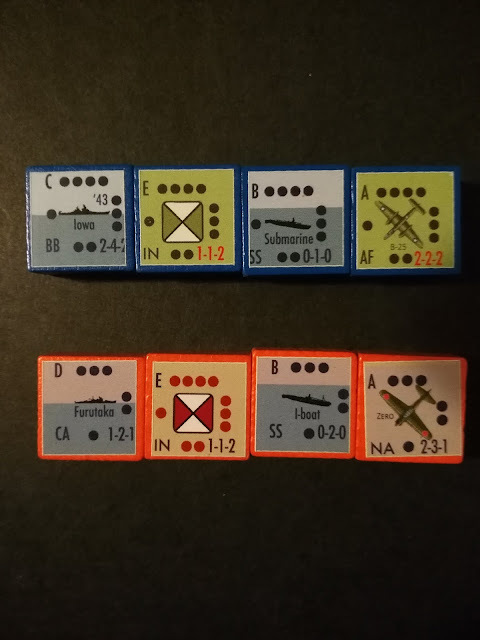 If both sides have the same letter in the combat round, the defender attacks first. Battles can be fought for a maximum of three combat rounds. During a combat round a unit can either fire/attack or retreat. The blocks, as usual, are marked with dots on each side to show their strength at that moment. The number of dots also represents the number of die that the unit can roll during firing. In the lower right hand of the stickers is a list of numbers, for example 1-2-3. This corresponds to the die roll an enemy would have to roll for a hit. 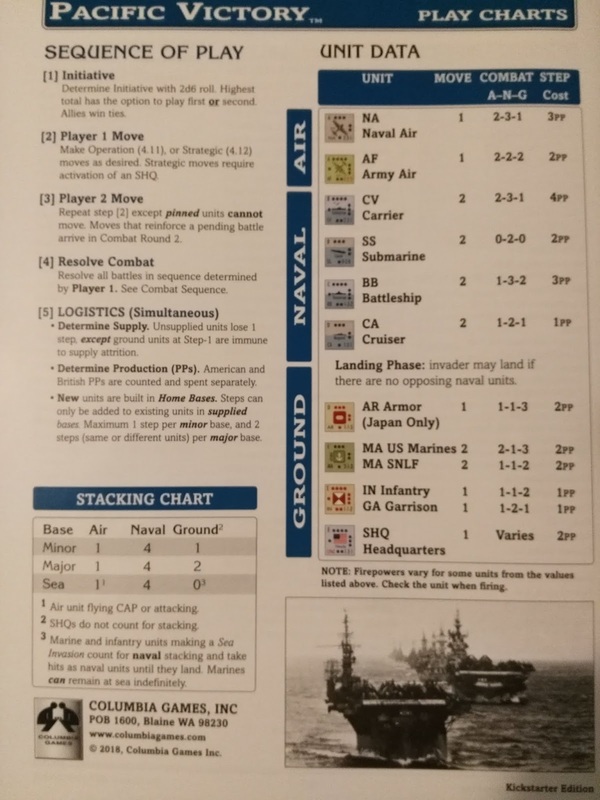 The numbers 1-2-3 would equal the die roll for attack by an Air, Naval, or Ground unit, A/N/G in the rule book. I have played some monster games on the Pacific War. I have also played some much smaller and simpler ones that played very quickly. I would place this game in the middle of these two types of games. This game is able to be played in one gaming session, but it is also deep enough to keep players coming back for more. I am not a fan of light 'beer and pretzels' games. So be assured this is not one of them. 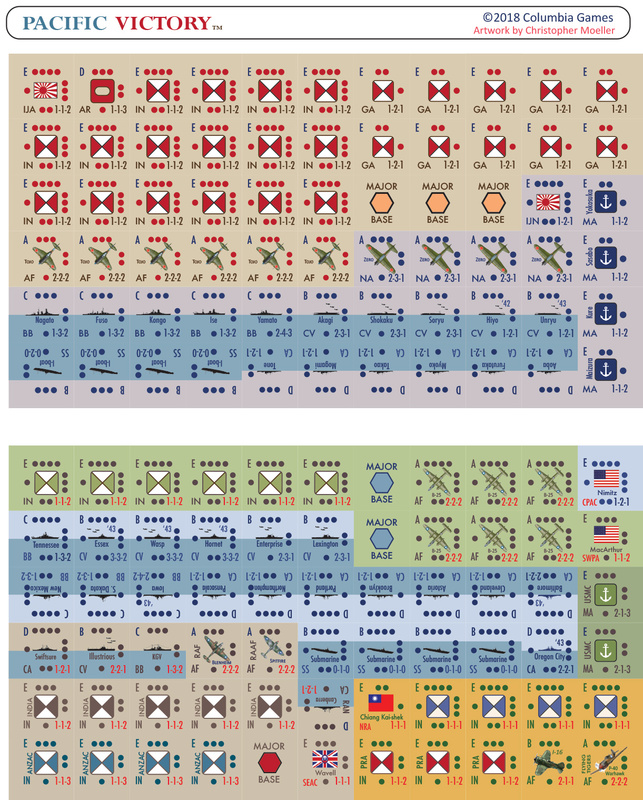 The only real disagreement I would have with the designer (Tom Dalgliesh) is the choice of units and unit strengths. The battles are quickly played out in the game. So, you might even be able to get two games in on gaming night. This is a good game in that while it doesn't try to be a simulation of the Pacific War is still a good fun game for players. As far as it being the Second Edition (with 2.5 version rules), people seem to only have good things to say about it compared to the first version. 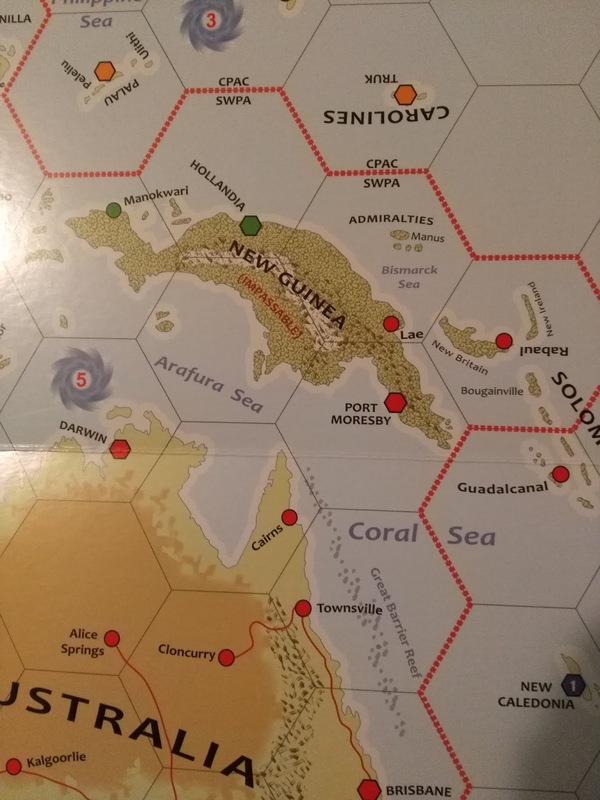 It has larger map, more leaders, and overall the rules have been tweaked to be even better.Thanks again to Columbia Games for letting me review this game. Now, get to work on the Eastern Front for Combat Infantry.